The deaths of Uday and Qusay Hussein have been welcomed by a member of Iraq's governing council during a break in talks in London. Speaking at a news conference alongside UK Foreign Secretary Jack Straw and Defence Secretary Geoff Hoon, Dr Adnan Pachachi also said there was now a feeling in Iraq that US-led forces were a step closer to dealing with Saddam. Mr Straw said that Uday and Qusay had "every opportunity" to leave Iraq and go into exile but they made their choice when they decided to stay. Earlier on Thursday the members of the Iraqi governing council had held talks with Prime Minister Tony Blair. 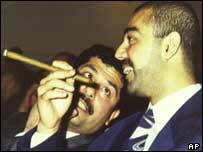 The news conference came the day after Tony Blair said the deaths of Saddam's sons was a "great day for the new Iraq". Dr Pachachi told reporters: "The death of Qusay and Uday has been welcomed by the Iraqi people because they were a symbol of all the oppression which was imposed on the people of Iraq for decades. "And also there is a feeling that their deaths will hasten the end of the acts of violence that have been perpetrated recently. "Also there will be a feeling that the next target will be perhaps Saddam himself because they have come close to the top man." Mr Straw said: "Saddam Hussein and his sons had every opportunity to be free outside Iraq. "The Hussein brothers had every opportunity even after the coalition forces had liberated Iraq to offer themselves up and to be alive and I think it was they who made their choice." The two men died on Tuesday in during a gun battle with US foces at a villa in Mosul in northern Iraq. 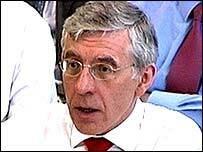 Mr Straw said at that time that UN Secretary General Kofi Annan had reported 290,000 Iraqis had disappeared over the last three decades. "Saddam was the man principally responsible for that, but Uday and Qusay appeared to have been extremely unpleasant psychopaths who actually killed quite a number of people with their own hands, as well as in the latter decades of Saddam's rule, authorised and supervised the reign of terror."